Set a table that will be the envy of everyone you know with Dwell's latest favorites for fun and funky modern tableware. From sleek and swooping flatware to bold place settings to a cheerful cake stand, your table will be bright and inviting for all your guests. Created by award-winning Japanese architect and designer Toyo Ito, this distinctive cutlery set draws on the tactile sensation of chopsticks. Its sleek, linear lines are softened with an organic quality inspired by plants. The result is an elegant harmony. 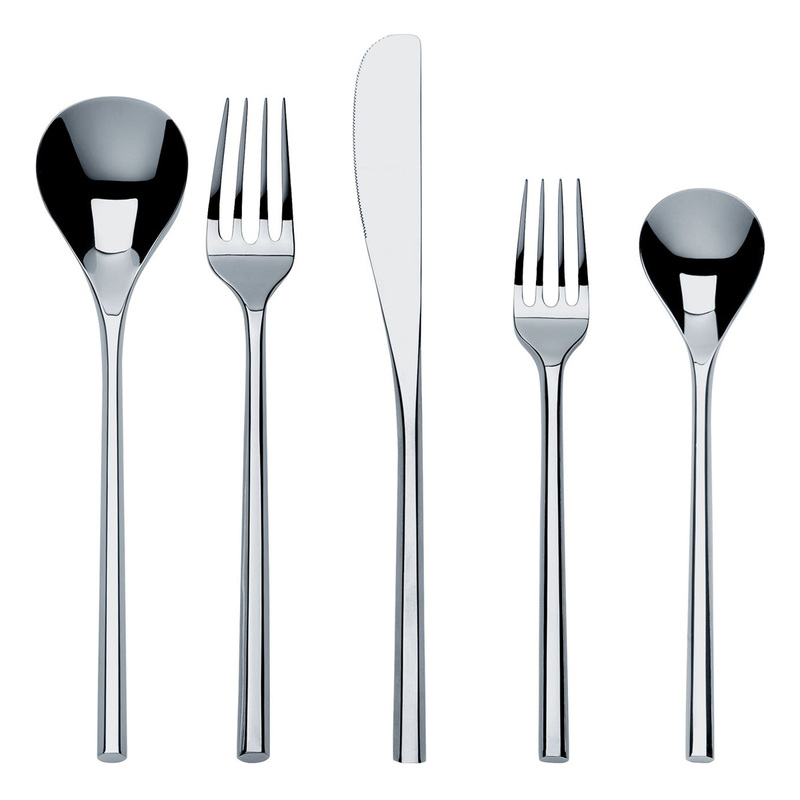 Composed of one table spoon, one table fork, one table knife and one dessert fork in 18/10 mirror polished stainless steel. A compliment to the MU Flatware Place Setting or beautiful on it's own, this serving set is created by award-winning Japanese architect and designer Toyo Ito, and draws on the tactile sensation of chopsticks. Its sleek, linear lines are softened with an organic quality inspired by plants. The result is an elegant harmony. Mid-century industrial designer Russel Wright believed that the table was the center of the home. First designed over 60 years ago, the Russel Wright Residential Collection is available once again, crafted from durable, shatterproof melamine. Winner of the Good Design Award from the Museum of Modern Art (1953, 1954), the Residential Collection remains an icon of the 20th century––and now 21st century––home. BPA Free. Dishwasher safe. Crafted from durable, shatterproof melamine, this cream and sugar set is perfect on it's own to add a pop of color to your table or coordinated with any other pieces from the award-winning Russel Wright collection. BPA Free. Dishwasher safe. The Colour Glass collection is a range of minimalist glassware by Scholten & Baijings. It includes high and low water glasses, a red wine glass, a white wine glass, a champagne glass and a carafe. The glasses and carafe come in in three different designs: with yellow or blue fading from the top, or a golden dot at the bottom of the vessels. The red wine glass comes with a pink square on one side, the white wine glass has black grid lines and the champagne glass features golden grid lines. Young Dutch design house Jansen+Co adds to its growing collection of brightly colored ceramic servingware with cheerful pedestal stands. Layout cupcakes, pies, cake of course, or anything you want to display on your tablescape. Traditional form meets contemporary styling in the minds of Jansen+Co founders Anouk Jansen and Harm Magis. Made of high quality ceramic, these mugs are perfect for serving that little bit of espresso at the end of a fabulous meal. They are a beautiful combination of industrial production and hand finish. Their shape is classic with twist and is available in bright colors and urban tones.